The virtually unspoilt town of Beruas is well off the beaten track for most of us, but I actually made the effort and got there last year. The museum is set in the heart of the town about 40Km away from Sitiawan and is housed in what used to be the town’s court building. 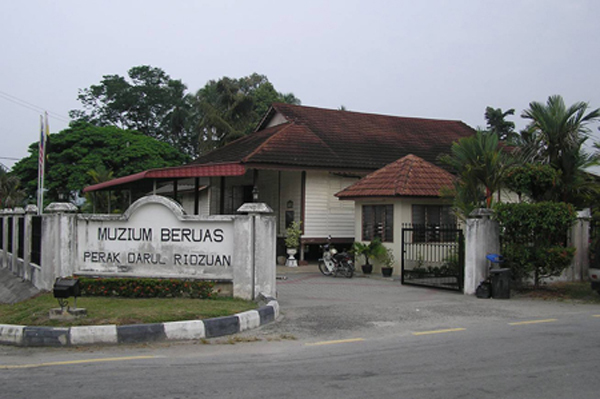 Set up in 1995, this is a small and unusual museum for Malaysia, as it displays artifacts some 500 years old, relating solely to the Beruas area, many of which have been dug up in 1991 by the Beruas Historical Survey Project. These items are believed to have originated from the Malay Sultanate in Beruas in the 16th Century. But the Beruas area is probably even older than that, as it is believed to be the site of the 6th Century, pre-Islamic, Malay and Hindu kingdom of Gangga Negara, one of the oldest civilisations in the region, which is referred to in the Malay Annals. This theory is supported by the finding of 6th to 10th Century bronze Hindu-Buddhist icons in wide area around Perak in places as far apart as Sungei Siput and Bidor. Whether this is the site of Gangga Negara or not, it certainly can lay positive claim to being the 16th Century Malay Sultanate for the many artifacts on display – a cannon, swords, kris, coins and pottery from the Ming Dynasty, an almost intact Celedon plate dating back to the 13th century and even the wreckage of an ancient ship, believed to be that of Arab traders, leaves the visitor in no doubt of their authenticity. But apparently there is much more to find in the area with some 15 archeological sites identified for further research. Added to this are the numerous artifacts dug up over the years by local people, some of which are on show in the museum. Particularly interesting of these are some of the old royal Acehnese gravestones which suggest that the area may have first been ruled by them. Indeed it is also suggested that over the centuries the town of Beruas has moved to accommodate changes in the course of the river and the subsequent changes in trading opportunities and that the original site may be what is presently called Kampong Kota where a number of royal tombs, tools and 16th century Chinese ceramics have also been found. Such is the mystery of ancient history, but one thing is certain, Beruas, wherever the exact ancient site stood, was an active trading port, 90Km inland on the Beruas River and host to ocean-sailing ships. This was recorded by one Tom Pires, a Portuguese official in 1512. Sadly in the 17th Century the river silted up and Beruas lost its trading opportunities. If you should visit the museum, why not try the Kopitiam next door. It is very good. mak saya berasal dari Beruas, oleh itu saya ada keturunan org Beruas. Beruas nie banyak sejarah, Gangga Negara dan lain2. Dah lama tak balek sana, tok semua dah takda, tinggai tapak rumah tok ja yang ada…. Yes,what you write is what,I have been led to believe.A very interesting town indeed.You should also visit the Naval Museum in Mellacca,very interesting and I am sure you must have visited the Museum in Taiping? I did not even know the museum existed. Would love to visit sometime. Anyone wanna tag along? OK ajt, do contact me at aaronflong (at) hotmail period com. I can arrange for a day visit to Beruas. And also to the old tin dredge at nearby Tg Tualang, if you like. Hope admin does not mind me putting ipohecho’s link there. We are quite happy to feature the Ipoh Echo as we work closely with them. Make sure you get a copy! I remember that there was a Magistrate’s Court in Bruas which was in an old wooden building. Wonder whether it is still there. I have seen someone attending court in singlet and short pants and slipper and the Magistrate overlooked this.